Gajanan Anant Joshi also Gajananbuwa Joshi (30 January 1911 - 1987) was a unique and versatile vocalist and probably the greatest violinist in the field of Hindustani music. Pandit Gajananrao Joshi also known, respectfully and affectionately, as Gajananbuwa Joshi came from a family of musicians. His grandfather Manohar had studied dhrupad and dhamar, and his father Anant (Anant Manohar Joshi was known as Antu-Buwa) was a distinguished khayal singer who had studied under Balakrishnabuwa Ichalkaranjikar. Gajananbuwa studied gayaki of Gwalior gharana under his father and also under other teachers in whom he found something to learn, and assimilated other styles in his art. His other gurus were Vazebuwa of Gwailor Gharana, Vilyat Hussein Khan from Agra gharana, Bhurji Khan from Jaipur-Atrauli gharana and Pandit Vinayakrao Ghangrekar for "Tabla"
Pandit Gajananbuwa Joshi was a highly skilled violin player by the age of 20. His students include vocalist and violinist Madhukar Joshi, Vikas Kashalkar, Ulhas Kashalkar, Padma Talwalkar, and violinist Shridhar Parsekar. He also taught vocalists Kaushalya Manjeshwar, Shubhada Paradkar, Veena Sahasrabuddhe and Jayashree Patnekar. His daughter Malini, sons Manohar, Madhukar and Narayan are also trained musicians. His sons variously took to singing, violin, and tabla. His grasp was so quick that it is said that Kesarbai Kerkar did not like to have him attend her concerts because he could quickly incorporate her strengths in his own singing. Buwa worked as a Professor of Music at the Faculty of Music, University of Mumbai in 1970. He also worked as a Music Advisor to All India Radio from 1956 to 1968 at Mumbai, Indore and Lucknow Radio Stations. His autobiography and his compositions for Violin written by him was published in the form of a book by the renowned Mouj Publishing House in Mumbai. Throughout his life, Gajananbuwa was invited to participate in almost all the major music conferences, festivals and events all over India. In addition he was also invited to go to Nepal and Pakistan to take part in Music Programmes. Sangeet Natak Akademi Award in 1972. An award given in 1982 by the ITC Sangeet Research Academy, a Trust promoted by ITC Limited, Calcutta. Tansen Samman given by the Government of Madhya Pradesh in 1985. Gajananbuwa’s first and principal Guru was his father Pandit Anant Manohar Joshi affectionately called Antubuwa. His family and many of his disciples used to address him as ‘Baba’. Antubuwa was born in 1881 in a small village ‘Kinhai’ near Aundh in Satara District in Maharashtra State. Antubuwa’s father Pandit Manoharbuwa was also a singer gifted with a melodious and sweet voice. Pandit Manoharbuwa’s performances were so impressive that in a concert where other musicians were also performing Manoharbuwa would be the last performer; an honour normally bestowed upon the ‘best’ musician in a gathering of several musicians. Pandit Manoharbuwa unfortunately died when Antubuwa was only seven years of age. Antubuwa’s mother after some preliminary training in Music to Antubuwa by one Mr. Ayachit approached the great Balkrishnabuwa Ichalkatnjikar who agreed to teach Antubuwa. Balkrishnabuwa himself was a highly accomplished and eminent musician of Gwalior Gharana Gayaki. Antubuwa received training from Balkrishnabuwa for about eight to nine years after which Antubuwa began his own career as a Gwalior Gharana Vocalist initially as a court singer of the princely state of Aundh. As luck would have it Antubuwa got an opportunity to travel with and accompany on Tanpura the Great Ustad Rehamat Khan Saheb whose father was Ustad Haddu Khan Saheb one of the originators of the Gwalior Gharana. Needless to say that exposure to Ustad Rehamat Khan Saheb’s Gayaki enriched Antubuwa’s Gayaki. After couple of years in the company of Ustad Rehamat Khan Saheb Antubuwa settled in Mumbai and started his own school of music. In addition to teaching, Antubuwa also wrote and published books for learners of music. However, due to the changed circumstances in his life Antubuwa left Mumbai and returned to Aundh as a court singer of the Aundh State. His services were welcomed by the well cultured and supporter of arts the prince Balasaheb Pantapradhinidhi. Young Gajanan was already showing signs of a sharp and intelligent learner of his father’s music. In Mumbai Antubuwa’s school was open for nearly eight hours. So young Gajanan was exposed to music for a long time on a daily basis. However Gajananbuwa’s face to face training from Antubuwa started in Aundh. The initial musical conditioning (संस्कार) of Gajananbuwa took place under his father’s tutoring. The seeds of pure Gwalior Gayaki were thus sown in the fertile mind of Gajananbuwa at a very tender age. Although Gajananbuwa later mastered the Gayaki of Jaipur and Agra Gharanas his first and last love always remained the Gayaki of Gwalior Gharana. In fact his Violin playing mostly was based on Gwalior Gayaki. It is interesting and quite revealing how a good grasp by Gajananbuwa of his father’s Gayaki was observed by none other than the great Ustad Faiyaz Khan Saheb of Agra Gharana. Gajananbuwa had an opportunity to meet Ustad Faiyaz Khan Saheb in Mysore. Khansaheb asked Buwa to sing for three consecutive days. Buwa responded by singing for an hour or so on each day. After the third day’s singing session of Gajananbuwa Faiyaz Khan Saheb asked Buwa how-come Buwa picked up the Gayaki of Ustad Rehamat Khan Saheb given that Buwa would not even have seen Rehamat Khan Saheb let alone listened to Rehamat Khan Saheb’s music. This is an excellent example of how a sensitive and intelligent young boy learnt the Gayaki of his father Antubuwa whose Gayaki in turn was influenced by Rehamat Khan Saheb’s Gayaki! 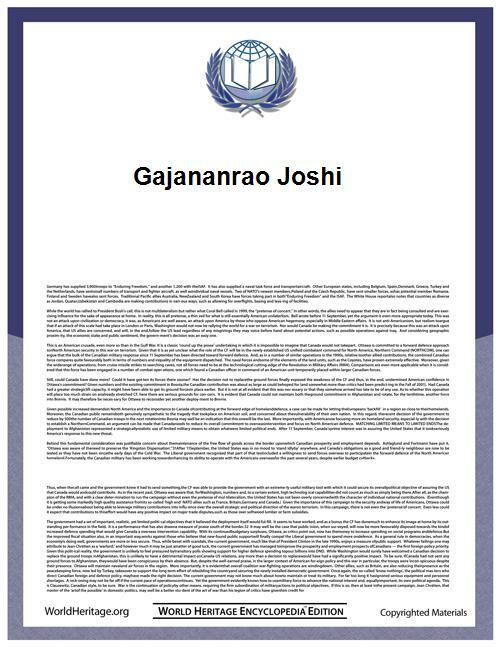 Giving a judgement on his son's progress in Music Antubuwa as a Guru of young Gajanan observed that “Gajanan was very intelligent and quick to pick up with ease - like a blotting paper - the various features of Gayaki! He had an inherent talent for rhythm . He also learnt ‘Jaltarang’ Harmonium, and Sitar. He thus learnt both Gwalior Gayaki and instrumental music at a young age”. Listening to Antubuwa’s performance is like going close to the original roots of Gwalior Gayaki the Gayaki that Gajananbuwa preserved and enriched throughout his life. Here are couple of anecdotes about Antubuwa that give some insight in the depth of Antubuwa's thinking about Music. One of Gajananbuwa's disciples gave his maiden performance in the Shivanand Sangeet Mahotsava in Aundh. After his performance was over, the somewhat nervous disciple approached Antubuwa and asked how did he - i e the disciple performed. Antubuwa asked the disciple what Raga he rendered. The disciple named the Raga. The young disciple was eager to learn Antubuwa's response. After a pause Antubuwa said "Well, Now that you have rendered such and such Raga, when would you start SINGING the MUSIC" We leave the reader to work out the relevance of this story. On another occasion whilst teaching one of his disciples Antubuwa said : A Raga is not a flat in Bombay with two doors. It is a palace with hundred doors! The same concept about Raga that it has many faces was described by a metaphor of an elephant who can be viewed by many angles. The vocalist who described it was another great musician of recent times - Pandit Kumar Gandharva. Perhaps this is an example of how great minds think alike! Pandit Antubuwa passed away in 1967 in Gajananbuwa’s house in Dombivali. For an in depth analysis of Antubuwa's Music please refer to Dr Ashok Da Ranade's book "They lit the way". ग्वाल्हेरला बुवांच एक गाण ऐकल्यावर श्रोते - रसिक आणि गवयी - अन्तुबुवाना म्हणाले " बुवा आपले चिरंजीव दोन दिवसांपूर्वी आले होते आणि असे उत्तम गायले कि काय सांगावे! अप्रतिम गाऊन गेले." अन्तुबुवानी बुवांना पत्रातून लिहिले " तुझी सर्व गायकांनी हृदयापासून तारीफ केली. ती ऐकून धन्य झालो. मी तुला शिकवले त्याचे चीज झाले! " बुवांनी ते पत्र जपून ठेवले. Paraphrased in English. (Not a literal translation) In Gwalior on listening to Gajananbuwa in his vocal concert many music lovers and singers remarked to Antubuwa that his son's performance was matchless - without an equal! Antubuwa in his letter to his son wrote " I was so happy to hear so many singers admiring your singing from the bottom of their hearts. I got my reward of being your Guru! " Gajananbuwa securely preserved his father's letter. This fascinating event is narrated by Shri Baburao Joshi of Kolhapur. Baburao was the president of the famous Deval Music Club in Kolhapur when this event took place. What follows is a brief paraphrased version in English of Baburao’s original piece in Marathi. “A programme to pay reverence and to honour the legendary actor singer Bal Gandharva for his immortal contribution to Marathi Theatre and Music took place in the Palace Theatre in Kolhapur. The princess of the Kolhapur State Taraabi Saheb was the chief guest. The organisers of the event had also arranged a violin recital of Pandit Gajananbuwa with an accompaniment on Tabla by Ustad Thirakhwa Khan Saheb. Bal Gandharva was one of Buwa’s heroes. Buwa started the recital with Raga Mulatani. Buwa was in an excellent mood and spirit to pay his own respects to Bal Gandharva. Buwa’s Mulatani on Violin and khansaheb’s accompaniment on Tabla overwhelmed the audience with joy! No sooner the clapping noise of the audience was over than Buwa played the (मुखड़ा) opening notes of the landmark song ‘Narawar Krishna Saman’ (नरवर कृष्णा समान). Not only did the lyrical, playful and romantic rendering of Buwa’s violin almost mesmerised the audience but Bal Gandharva himself spontaneously uttered 'वा वा, देवा' clapping his hands!" The excerpts from Baburao Joshi's original piece in Marathi are given below: "बालगंधर्वांचा सत्कार झाला.व्यासपीठावर आले गजाननबुवा आणि थिरखवा खानसाहेब. वाजवायला सुरवात झाली आणि साभागराचे वातावरण क्षणात पालटले....बालगंधर्व श्रेष्ट नटसम्राट दाद द्यायला हजर! ...बुवानी नरवर कृष्णा समान या गीतावर गज फिरवला आणि प्रेक्षकांची अशी उत्स्फुर्त दाद मी कधीच पाहिली नाही! बुवानी धमाल आणि कमाल केली! बालगंधर्वांची श्रवण करता करता ब्रह्मानंदी टाळी लागली आणि उदगार आले " वाहवा देवा" .... पद संपल. कार्यक्रम संपला . पण बुवा आणि खानसाहेब यांची जोड़ी मनातून हलली नाही! " A similar event took place later in Pune. The location was the N M V High School. On the grounds of the school a stage was built to celebrate Master Krishnarao's 60th Birthday. Master Krishnarao's friends, fans, and disciples had organised a three day festival of music. Musicians from different parts of India participated in the celebration. Among them were Bade Gulam Ali Khan Saheb, Ustad Ajamat Hussain Khan Saheb, Gajananbuwa, and Ustad Thirakwa Khansaheb. Gajanabuwa was an admirer of Master Krishnarao. When Buwa's turn came to play violin he started his recital with Raga Jogkans. As usual Buwa's extempore rhythmic work (लयकारी) and Khansaheb's equally ingenious accompaniment more than pleased the listeners. Before Buwa started to play the second piece, Master Krishnarao who was sitting in the front made a request (फरमाइश) to Buwa. Surprise! Surprise! Master Krishnarao asked Buwa to play 'Narwar Krishna Samman' (नरवर कृष्ण सामान). To witness this extraordinary concert was once in a lifetime opportunity! Buwa's violin was singing the tender and loving poem about Rukimini falling in love with Krishna. Master Krishnarao and other celebrity musicians were showering the spontaneous responses (दाद) to Buwa's performance! Here was the live music making at its best where the musicians and the listeners became one! The significance of these two events is not easy to appreciate for many of us. Here was Bal Gandharva one of the greatest singers of all time who had sung this song ‘Narawar Krishna Saman’ thousand times on the stage. He had almost ‘lived ‘this song! Here was Master Krishnaro a friend, a colleague and a Guru Bandhu of Bal Gandharva. He had acted with Bal Gandharva and would have listened to 'Narawar Krishna Samaan' thousand times. Ask the question: What was it that Bal Gandharva and Krishnarao found in Buwa’s rendering of the song that so much appealed to them? Only Bal Gandharva and Master Krishnarao would know the answer to this question. However let us venture to guess or speculate an answer : Music is an abstract art form. Through Music a musician may be searching some kind of experience that transcends the material world, an experience that is spiritual. That search may be for the ultimate beauty, ultimate truth, God or Brahman or whatever you may call 'it'. Geniuses like Bal Gandharva and Master Krishnarao perhaps did get that 'feel' of spiritual experience in their own music making. It may be that their own experience of singing a song like 'Narawar Krishna Samaan' mirrored in the act of listening to Gajananbuwa's rendering of this song. May be they re-experienced, relived that 'feel' of the' transcendental' in Gajananbuwa's music! For Gajananbuwa to receive such an accolade from Narayanrao and Master - as Buwa often used to refer to Bal Gandharva and Krishnarao-must have been one of the finest and satisfying moments in his life. There cannot be a better evidence than these two concerts described above to support a value judgement that Gajananbuwa was probably the Greatest Violin Player if such an evidence is needed at all! We see here an interesting chain of connections. Ustad Alladiya Khan Saheb - the Mount Everest of Hindustani Classical Music had applauded Bal Gandharva's Gayaki. Bal Gandharva and Master Krishnarao applauded Gajananbuwa's singing violin. Buwa was a disciple of Alladiya Khansaheb's disciple and son Ustad Bhurji Khansaheb. Bal Gandharva and Master Krishnarao were disciples of Alladiya Khan Saheb's disciple Pandit Bhaskarbuwa Bakhale! For most music listeners whatever their level of competence and knowledge in Music there clearly is some indescribable magic in Buwa’s rendering of ‘Narwar Krishna Saman’. That magic is as fresh today as it was then. In 1950–51, an all-India music conference was organised in Bharatiya Vidyabhavan in Mumbai that was broadcast by All India radio. Gajananbuwa was invited to play Violin and so was Ustad Thirkhwa Khasaheb to accompany Buwa. Another well known Tabla player of Banaras Gharana the well known Pandit Samta Prasad was also an invitee to the conference. Pandit Sampta Prasad having heard that Thirkhawa Khansaheb was to accompany Gajananbuwa, asked the AIR management "why am I not accompanying Gajananbuwa?. He is such a well known musician. Why only Thirkhawa Khansaheb should accompany Gajananbuwa?" (गजनानबुवान्च्याबरोबर फक्त उस्ताद थिरखवाच का?) After some discussion between Buwa, AIR management and Thirkhawa Khansaheb, Khansaheb suggested that both Samta Prasad and he shoud accompany Buwa. In the end it was agreed that both the Tabla masters would individually accompany Buwa. Rarely two great Tabla players were so eager to accompany a great instrumentalist! Here is a real treat for you. Gajananbuwa plays Raga Mulatani and Khansaheb accompanies him on Tabla, a live performance. Please visit Pandit Gajananbuwa's Website for more information. He was a child prodigy. He started translating the musical configuration - Tanas - in the musical notation - Saragama -at a young age. Of course one could argue that Buwa's talent at a young age was not a surprise because he was the son of the Great 'Pandit Antubuwa Joshi' ! He was one of the few musicians who had mastered the Gayaki of three different Gharanas - i.e. Singing style of three musical traditions- schools. It is difficult enough to learn and grasp the Gayaki of one Gharana. It takes many years may be a lifetime to master the Gayaki of a single Gharana. Buwa however mastered the traditions of three musical schools in one lifetime. He was probably the only Musician of an exceptionally high standard who was both a vocalist and an instrumentalist. Indeed he is rightly credited to have introduced the use of violin to play the Indian Classical Music. He was an undisputed grand master of Laya - Rhythm. He was an illustrious Guru (teacher) who generously taught, trained and passed on his knowledge and Gayaki on a one to one basis to many noted musicians of today who continue the tradition of his musical style (Gayaki). Buwa had an unending thirst to learn music, understand music, master music, widen his knowledge of music, and get a deep insight in music. The obvious way to quench his thirst was to expose himself to the Gayaki of various established musicians of his time and then to learn and master the Gayaki of different Gharanas (Schools). Mastering the Gayaki (singing method and style) of a given Gharana naturally involved mastering new Ragas and new compositions (bandishes). However a question arises as to what was the source of Buwa’s thirst for being a lifelong learner of music? What motivated him? The source of such hunger to learn may have lied in his sheer sense of wonder and excitement about the beauty and the depth of the vast Universe of Music. After learning and mastering Gwalior Gharana Gayaki from his father Pandit Antubuwa a young, ambitious and upcoming Buwa came in contact with other musical traditions. Being aware of his own strength in terms of his sharp intellect, excellent memory, quick grasp of the musical material presented, fertile imagination and also the limitation of the quality of his poor voice he seems to have chosen the Gurus and the Gharanas that matched his musical background and his strength and limitations. Thus he started his musical journey as a child learning from his father the great Pandit Antubuwa. His further musical growth came about when he became a disciple of Pandit Vazebuwa. It was Vazebuwa’s complex Gwailor Gayaki that attracted Gajananbuwa to Vazebuwa. This was followed by his progress to the beautifully structured, logically precise and tightly woven complex Gayaki of Jaipur Gharana under the tutelage of his Guru Ustad Bhurji Khansaheb. And finally in his late forties to enrich his Gayaki further he became a disciple of Ustad Vilayat Hussain Khansaheb to master the rhythm based ‘Nom Tom’ Gayaki of Agra Gharana. A remarkable and unique journey indeed! He almost invariably sang Khyal in his performances. He presented a given Raga in a well defined framework of a given Gharana. His remarkable talent was such that in singing a Jaipur Gharana Raga say there would be no trace whatsoever of the Gayaki of another Gharana. He did sometimes start with ‘Nom Tom’ of Agra Gharana and would continue singing a Khyal in Gwailor Gharana Tradition. But the two parts of his performance would be distinct, and the movement or flow from Nom Tom to Aalapi would be smooth and natural. There would never be any mixture of Aalapi or Tana Patterns or phrases of the Gayaki of two or more Gharanas. An extraordinary feat! One of the key lessons Buwa learnt from his Guru Vazebuwa was how to unravel or unfold a given Raga (राग कसा सोडवायचा). The result of mastering this lesson from Vazebuwa was that in Gajananbuwa’s performances a listener would often experience both the clarity and simplification of complex patterns of Tanas. The so called conceptual or intellectual Gayaki of Jaipur Gharana sounded less complex in Buwa’s presentation. His voice as a result of a continuous and rigorous daily Riyaz of many hours had acquired extraordinary weight (vajan) and perfect tunefulness (Surelpana). His tremendous and legendary hard work to Improve the quality of his voice is well documented . The great Hirabai Badodekar once after attending Buwa’s concert in Pune in an annual Ganapati Festival generously complimented Buwa by saying "Buwa, you are so exceedingly perfect in your tunefulness". It seems that underlying Buwa’s musical journey there was a search for 'ORDER'. Music can be defined as "ordered sound in time". Buwa’s love for Laya (Rhythm), his complete mastery of Talas and rhythm, his restlessness to learn the Jaipur Gayaki - that is the very incarnation of the concept of order in a musical form - after he heard Surshree Kesarbai and his eventual success in mastering the Jaipur Gayaki are all examples of his instinctive and natural love for ‘ORDER’. Some mathematicians define Mathematics as the science of order. We may describe Music as an Art of order. If Gajananbuwa had chosen to be a Mathematician it is more than likely that he would have made some significant contribution to Mathematics. But the world of Hindustani Art Music is fortunate that he became a singer. For otherwise the Indian Classical Music would have lost one of the finest vocalist of recent times who only lived for MUSIC - to learn, to teach and to perform Music! For an excellent technical and lucid exposition of Buwa’s Gayaki, please check out Dr Ashok Da Ranade’s beautifully written essay in his book: "Some Hindustani Musicians. They Lit The Way". Dr. Ashok Ranade a well known Musicologist and scholar was a disciple of Buwa. The above book is published by Promilla & Co in association with Bibliophile South Asia. Violin is capable of expressing precision, power, agility and a kind of mystical or spiritual beauty. In the hands of a creative musician or a composer it has the ability to convey a deep emotion or a range of emotions imaginatively and intensely. In other words violin is capable of extraordinary lyricism. Violin is THE key string instrument in the Western Classical Music. A western Classical Symphony without a violin is like Valmiki’s Ramayan without Rama or Shakespeare’s play Hamlet without the character of Hamlet. Symphony is considered the highest form of musical expression in the Western Classical Music. The Raga Sangeet –The Raga Based Musical System – is the highest form of musical expression in the Hindustani Art Music. Pandit Gajananbuwa’s greatest achievement was to introduce violin to the world of Hindustani Art Music. Note however that Buwa went well beyond simply introducing Violin to Hindustani Art Music. He was and remains probably the Greatest Violinist in the field of Hindustani Art Music. The entry of violin in Buwa’s life was an accident and a happy accident at that for the world of Hindustani Music! Buwa’s father the great Antubuwa was a court singer in the small princely state of Aundh in Maharashtra. The prince of Aundh was a culturally refined person. He himself was a KIRTANKAR - कीर्तनकार (A story teller and a singer with the accompaniment of musical instruments. The stories are usually based on religious themes and in the praise of the Gods.) The Prince of Aundh had an old violin that he gave to Antubuwa so that young Gajanan can accompany the Prince in his story telling recitals.Gajanan who was only a young boy obeyed his father and thus started his career as a violinist. Gajananbuwa had no formal training or guidance from any one whatsoever in the technique of using and playing the violin. There was no guidance to him about the intrinsic properties of a violin so that he can make proper use of such properties in his music making. In short Buwa was a totally self trained violinist. He naturally developed his technique to suit the musical material he wanted to present on the violin. What was this material? It was his rich repertoire of Raga Sangeet that consisted of Ragas, compositions (Bandishes) and Gwalior Gharana Gayaki. What other musical material Buwa presented on his violin? Buwa was somewhat conscious of the not-so-good quality of his voice and may have felt that his voice was not adequate to sing the 'feel' of the lighter musical phrases of Murakis or Khatakas to convey the lyricism of non-khyal genres of Hindustani Art Music. Add to that his love and admiration for Bal Gandharva and Master Krishnarao. Is it a surprise then that he found violin to be the best vehicle to play the famous songs from Marathi Musical Theatre and Dhuns (A Dhun in an instrumental mode is equivalent to a Thumri in a vocal mode.) in Ragas Kafi, Khamaj, Mand or Pilu? His semi classical pieces on violin revealed his romantic, playful, lyrical and imaginative musical mind. What he lost in his adolescence by way of his broken voice was at least partially gained by his acquiring a superb mastery of violin. Buwa exploited his proficiency in playing violin with a vengeance! In almost every violin concert Buwa presented at least one Dhun or a Natya Song to the delight of his listeners. But more importantly he fruitfully engaged in exploring the world of semi classical Hindustani Music. What is remarkable is that Gajananbuwa’s musical genius as a whole shows his masterful grasp of a wide range of musical genres. In his vocal mode he sang only khyals of the three Gharanas. In his violin playing he created his own compositions and rendered them in his Khyal Gayaki idiom. And he displayed his creativity in the semi classical genres that allowed him a free play of his imagination. In his violin playing his love and mastery of the rhythm (Laya) and Tala gave him sufficient scope to display his aggressive rhythmic work using his forceful and somewhat rough bow work. Is it a wonder that music lovers all over India enjoyed his violin concerts when Ustad Thirkhawa Khan Saheb accompanied Buwa on Tabla. Here was an astounding treat to the music lovers when these two outstanding musicians would be improvising the dazzling magic of rhythmic patterns within the fixed framework of a given Tala! Despite Buwa’s popularity as a violinist and his presence in the numerous concerts and musical conferences all over India, Buwa’s true love was his Gayaki in vocal mode. He was the son of a great vocalist Pandit Antubuwa and his ambition was to be equally a great vocalist in his own right and continue the tradition of Antubuwa’s Gayaki. He did succeed in fulfilling his ambition. But in addition, thanks to the prince of Aundh’s gift of the violin to Buwa, Hindustani Art Music received a precious gift of Gajananbuwa’s violin that SANG Classical and semi classical music! The expression 'singing violin' can be truly and justifiably applied to Buwa's violin. Violinists Shreedhar Parsekar, Gajanan Karnad , Buwa's sons Manohar Joshi and Madhukar Joshi. Vocalists Padmashree Ulhas Kashalkar, Dr. Arun Kashalkar, Dr. Vikas Kashalkar Jayashree Patnekar, Padma Talwalkar, Shubhada Paradkar, Kaushalya Manjeshwar Dr.Ashok Ranade, Veena Sahasrabuddhe, Shaila Datar, Kunda Weling, Buwa’s son Madhukar Joshi, Buwa’s daughter Sucheta Bidkar and Buwa’s granddaughters Pallavi Joshi and Apoorva Gokhale. Here is a web link for Gajananbuwa's one to one tuitions he gave to his disciples. कृ. द. दीक्षित म्हणतात: "बुवा जेव्हा जयपुरी चीज गातात तेव्हा त्यांच्या इतकी लयकारिची बंदिस्त आवर्तने त्याच घराण्यातील गायकांपेक्षा सुंदरतेने दाखवितात. बुवांच्या गाण्यातली ही बहाद्दुरीच म्हणायची! " "Whenever Buwa sings a Jaipur Gharana composition he presents his structured rhythmic work more beautifully than the vocalists of Jaipur Gharana. That surely has to be acclaimed as Buwa's triumph!" K D Dikshit was a senior executive at All India Radio, a writer, music critic and above all a music connoisseur. श्री वामनराव देशपांडे -संगीत जाणकार, गायक आणि समीक्षक: "आज या जन्मदात्या ग्वाल्हेर घराण्याची थोडीफार वाताहात झालेली दिसते, तरीसुद्धा पंडित गजनानाबुवा जोशी यानी ग्वाल्हेर गायकीची ध्वजा उंच फडकावत ठेवली आहे." Paraphrased (not literally translated ) in English: Mr Vamanrao Deshpande -Musicologist, singer and critic: "In the current somewhat run-down state of the Gwailor Gharana Gayaki that is the mother of other Gharanas, Pandit Gajananbuwa Joshi is at the forefront of Gwailor Gharana carrying forward it's rich tradition." Professor G H Ranade in the Sangeet Natak Academy Journal Number 4 writes: "Gajananbuwa is ranked today, as a master of musicians. In his own turn, he has added one more feather to his cap, by mastering the art of playing the violin, in a class by himself. Antubuwa's greatest contribution to music is thus personalised in his son Gajananbuwa." What a wonderful compliment! From the Newspaper 'LINK' dated November 8, 1959: The best combination heard in the Sammelan was violin by Gajananrao Joshi of Bombay and tabla by Karamatullah Khan of Calcutta. Both played with inspiration and verve and opened up new vistas of aesthetic enjoyment. Joshi's Raga Khamaj was intensely lyrical and was enlivened by occasional counterpoints. His dancing reproduced by Karamatullah on tabla, to which the latter added his own inimitable fluttering notes. Katamatullah could have stood on his own without occasional histrionics which detracted from the dignity of the occasion. This is a rare gem. Not many violin players have played GAVATI in this style. Variety shown is indeed awesome.Those who have heard him live will bless you for ever. Thanks a ton for uploading Jaijaivanti by Antubuwa...... I had listened to a 25-30 min recording in Shree by Antubuwa....I was stunned after listening to Shree.... What a style of singing..... And Gajananbuwa is equally amazing during the vocal support. Gajananbuwa's vocal rendering of Bhimpalas is superb. What is interesting about Buwa's performance is that he starts with' Nom Tom'. I recently listened to Faiyaz Khansaheb's DES. Outstanding! I just love Nom Tom of Khansaheb, Dhrupad vocalists, Gajananbuwa and Ratnjankarbuwa's few pieces among other musicians of Agra Gharana. For me the way these singers perform Nom Tom is like a Bhakta (devotee) asking the GOD of SWARS (NOTES) to bless them- the singers- by showing the inner beauty of the Swaras that is somehow hidden from them. The singers are telling the God of Swaras - try as much as they do, the secret of that divine beauty of the Swars is some how not within their reach. Hence their surrender to the SWARAS through the Nom Tom!! May be Gajananbuwa was attracted to Agra Gharana for its (Gayaki) singing of 'Nom Tom'. Of course having mastered the singing (Gayaki) of Agra Gharana, Gajananbuwa had an advantage of presenting a given Raga in Agra Gharana Gayaki. Is it a wonder that in many of his performances he would start with Nom Tom of Agra Gharana and follow the presentation in Gwailor Gharana style. This is precisely what Buwa does in his performance of Bhimpalas. What a delightful performance! In my opinion a sonorous voice, strong fundamentals of music, a very good sense of laya and honesty towards art are the distinct features of Gajananbuwa that make his music dear to the ear. The legendary Bal Gandharva once said to Antubuwa the father of Gajananbuwa: "Antubuwa, it is no surprise that your son Gajananbuwa sings Gwailor Gayaki so well. After all he was brought up at home with your Gwailor Gayaki. But Gajananbuwa presents the Jaipur Gharana Gayaki also with such mastery and confidence." This appreciation coming from Bal Gandharva speaks volumes about Gajananbuwa's Jaipur Gayaki! Note also that Bal Gandharva himself was taught by Pandit Bhaskarbuwa Bakhale a disciple of Ustad Alladiya Khansaheb the founder of Jaipur Atrauli Gharana. Here is a comment by Pandit Sujan Rane of New Jersey USA on Gajananbuwa's performance of the famous song 'Dehata Sharanagata' in Manapman on violin. Pandit Rane was a desciple of Pandit Firoz Dastur of Kirana Gharana. "The recording of Buwa's presentation of Dehata Sharanagata almost brought tears to my eyes. Only Chhota Gandharva could sing such varieties. Again I was fortunate to accompany him at Balmohan School, Dadar when I was learning Classical Music. I remember that Chhota Gandharva had sung Dehata Sharanangata in four different ways ( four Once Mores) at public demand, at Ravindra Natya Mandir way back in 60's. The emperor of Tabla the Great Ustad Thirakhawa Khan Saheb said about Pandit Gajananbuwa: "ऐसा बेडर बम्मन कलाकार आजतक हमने देखा नहीं" "To date I have not seen (met) such a fearless artist among Brahmins" This comment was Khansaheb's compliment to and appreciation of Buwa's adventurous, aggressive, extempore and perfect rhythmic work in general and in particular when Khansaheb was accompanying Buwa on Tabla. Is it a wonder that Buwa's Violin and Khansaheb's Tabla accompaniment was always a real treat to the music lovers and even the Great Grand Masters like Bal Gandharva and Master Krishnrao!